If Forrest Gump ever received this marvelous gift, he'd probably say, "Soap is like a box of chocolates!" 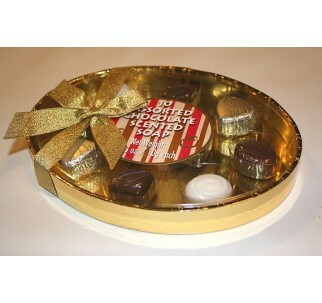 This amazingly 'life like' gift box is filled with ten deliciously scented chocolate soaps. It makes a great gift for anyone who loves chocolate but hates calories! It even comes with a lovely bow. Caution:Not edible. Use only in the bath!